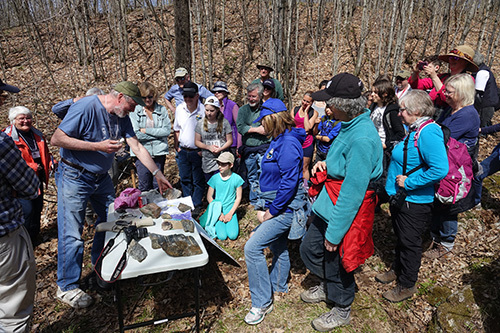 On Sunday, May 6th, 2018, some forty nature enthusiasts gathered at the Mississippi Madawaska Land Trust’s cliffLAND property for the annual spring hike to the summit of Blueberry Mountain. Last year a snow storm made the hike memorable for the few who made the trek. This year, a major wind storm the night before knocked out power across the region. A generator provided power for the coffee pot and the electrical service would be off for another few days. The spring walk included a side trip down the Porcupine Trail to view some billion year old rocks. 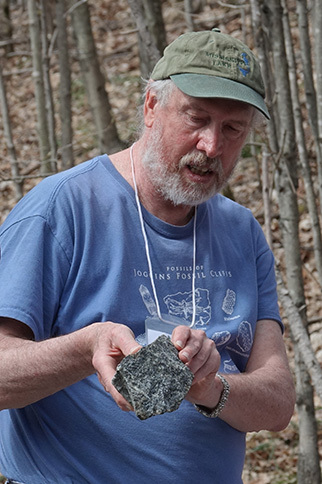 Bob Betcher, MMLT’s resident hydrogeologist/geologist showed us an outcrop of marble that was once limestone in a shallow sea but subsequently uplifted and altered by heat and pressure. The type of marble at cliffLAND is slightly soluble in acidic precipitation and over time has developed Karst dissolution features such as caves and sinkholes which can form important habitat for bats, snakes and other creatures. 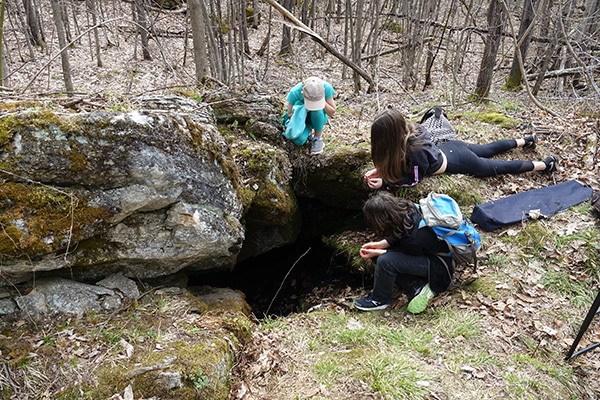 Participants got a good look at a cave recently used by porcupine. Refreshments were served after the geological demonstration and the climb. A good time was had by all. This was the second in the MMLT’s new Discover the Wild series for 2018. The Blueberry Mountain trail is open to the public year ’round and the view from the lookout is beautiful in all seasons. A map is provided below for your convenience.